Wrong Bear Put Down for Attack On Hiker! NASHVILLE (Reuters) – Officials at the Great Smoky Mountains National Park killed the wrong bear after a man who was hiking the Appalachian Trail was bitten in the leg earlier this month, a park spokeswoman said on Monday. After a bear bit through the hiker’s tent on May 10, park workers took saliva and fur samples to try to identify the bear that was responsible. The hiker was treated in a hospital and released. On May 13, before results came back from the DNA testing on the samples, park service wildlife officials confronted a 400-pound (180 kg) male black bear and tranquilized it. Wildlife biologists examined the bear and noted dental-canine injuries consistent with the hiker’s wounds, said Dana Soehn, spokeswoman for the park, which straddles the Tennessee-North Carolina border. “It was a large, dominant male bear that fit the profile of the bear we expected to be responsible for the attack,” Soehn said. The biologists decided to euthanize the bear because it was too big to be carried for six miles from the back-country to a place it could be confined while awaiting the test results, and they could not fit a tracking collar on its head, she added. When test results came back, it was determined that the wrong animal had been killed, she said. Park officials tranquilized another bear on Friday and released it with a GPS tracking collar while they examined its DNA, but that animal has also now been ruled out as the attacker. Approximately 1,600 black bears live in the park, about two per square mile, but Soehn said attacks are rare. Just a small glance at some of the success stories from the Michigan turkey woods! Another Michigan Turkey Headed For The Roasting Pan! We are winding down to the last days of turkey hunting season here in Michigan, and the Ansel boys just won’t give up. Yesterday my brother Brett filled his tag which means half of the six Ansel brothers took birds this year. Brother Darryl put one down himself, and helped Brett get his. Darryl can work magic with his turkey calling abilities, and did it yesterday morning in Jackson. Brett and Darryl hunted on the edge of a large woods, setting up a big Tom and two hen decoys. The birds had been coming off their roost and walking across a plowed field from one wood lot to another. The gobblers have been “silent” for the most part, and the turkey woods has been very quite in the early morning! The brothers sat for several hours and never heard a peep from Mr. Tom Turkey. They were at the point of calling it a morning when a group of Tom’s started across the field due to Darryl’s persistent yelps and cackles. The four Tom’s saw the decoys and strutted and gobbled their way into a shooting position for Brett. Darryl had his binoculars on the birds and determined there were three Jake’s and one mature bird with about an 8 inch beard. Darryl was trying to keep track of the larger bird and was relaying the information to Brett, as the birds entered a slight “dip” in the farmers field. Darryl had the older Tom “pegged” and when the four red heads popped up over the rise Brett squeezed the trigger on his Remington Model 870! Feathers flew, along with three startled lovelorn Tom’s! As luck would have it “the big one” lived to gobble another day, as Brett drew down unknowingly on a Jake. He said there were just to many “red heads” to keep track of, and it wasn’t going to change the taste of an oven fresh wild Michigan turkey anyway! Very true little brother! In all that’s seven birds in the Ansel’s freezer’s, and there’s still a few days left in the turkey season. Who know’s Darryl may “pucker” up and call another lovesick Tom into a roasting pan before it’s all over! Congratulation Brett on the second Tom Turkey of your short turkey hunting career! Polar Bear Grizzly or Hybrid? An odd-looking bear shot last week by a hunter in Nunavut has turned out to be a grizzly-polar bear hybrid — a rare find that a researcher says is becoming more common. Hunter Didji Ishalook, 25, spotted the animal on top of a hill near his home community of Arviat, about 260 kilometres north of Churchill, Man. From a distance he thought it was either an Arctic fox or a small polar bear. Up close it was shaped more like a grizzly, but its colour was like a polar bear. “It turned out to be a grizzly half-breed,” Ishalook said. Dave Garshelis, a research scientist from the Minnesota Department of Natural Resources and one of the world’s foremost bear experts, agrees with Ishalook. He believes the bear is a grizzly-polar bear hybrid, and not an albino grizzly bear. “An albino bear would have a light-coloured or pink-coloured nose, and no pigmentation in the eyes and the claws,” Garshelis said. Grashelis said polar bears and grizzly bears have similar genetics and have a history of interbreeding. He believes that interbreeding is happening more frequently due to climate change. “With climate change, grizzly bears are moving further north, so there is more overlap between grizzly bears and polar bears in terms of their range,” Garshelis said. Just last week my brother Brad shot his first turkey near his little farm west of Jackson. My brother Darryl called the big tom in for him and after a couple anxious moments put the lovesick Tom on the ground! As they set up in a fence row they put out a couple hen’s and a Jake decoy with a strutting pose. That is all it took to fire up the “big boy” and lure him away from the hen he was already tending. This is not easy to do, as the birds that already have a hen generally won’t wander to far away. Due to Darryl’s persistent wooing of clucks, cackles, yelps, and purrs this particular bird came in on a string. He strutted most of the way in and was going to show this “upstart Jake” who was boss in this area! Brad was pretty excited, and at 20 yards Darryl told him to take the bird! Honestly Brad wanted to “take” him at 20 yards but settled for an unbelievable 60 yard shot as his first two were slightly off target. I don’t know if it had anything to do with the barrel of the shotgun shaking all over the place, but Brad eventually got his act together and dropped a nice mature Tom. Brads bird had a 10-1/2 inch beard and weighed about 21-22 pounds. I think my little brother is now hooked on hunting these magnificent Michigan turkeys. What a great time of year to be in the fields and woods of the great outdoors. Congratulations Brad! You now have Thanksgiving dinner in the freezer! These are the kind of stories I love to share with my readers. My grandson Keegan McNamara has a good friend (Alec Hill) who just scored on the trophy of a lifetime, as far as turkey hunting goes! Alec is only 15 years old, but already has 3 big Tom’s under his turkey hunting belt. Of course much of the credit has to go to his dad Scott, who has shared his love for the hunt with his boys. Alec’s younger brother Tyler also has scored on three (3) birds at the tender age of 12. Many hunters go for years without putting a bird in the freezer, and the Michigan average is one out of three hunters tag’s a Tom! Scott your boys have the average blown away! What Alec and Scott didn’t know is this bird had multiple beards (4) which is quite unusual, and a highly prized trophy for turkey hunters. The four beards totaled close to 20 inches, which would make it a certain contender for the Commemorative Bucks of Michigan record book. Commemorative Bucks also keeps records of bear, elk, and turkeys. A tape measure set the length at 15¾ inches. A certified scale put the weight at 2 pounds, 14 ounces, officially 2.9 pounds. Those particulars since verified, Berg’s perch has been submitted to the Outdoor Writers of Ohio for confirmation as a state record. The record for 32 years had been a 14½-inch, 2-pound, 12-ounce giant taken April 17, 1984, by Chuck Thomas at Lorain Harbor. Berg’s perch measured 13½ inches of girth, although belt size isn’t part of the tale of the tape. It, like Thomas’ catch, was a female full of eggs. In fact, Berg’s fish fumbled away a few eggs — and quite possibly an ounce or two — as it lay in the cooler before the brothers took it to a nearby bait shop to get it weighed and measured. 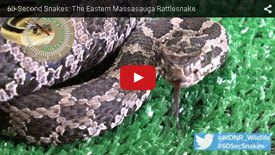 Whether you’re a hunter, a wildlife enthusiast or just someone who enjoys an occasional walk in the woods, this 60-second video will help you properly identify an eastern massasauga rattlesnake, should you ever find yourself lucky enough to come across this rare species in the wild. If you are fortunate enough to see one in your travels, enjoy it from a distance, and we’d appreciate you taking the time to complete an observation report online. Look for more videos in our 60-Second Snakes series throughout the summer and into the fall. The Michigan Department of Natural Resources announced today that a black bear recently shot and killed in Haring Township, north of Cadillac in Wexford County, is the same bear that mauled a teenage girl, Abby Wetherell, in that same township in 2013. The DNR confirms a 9-year-old female black bear was killed April 30 by an individual, who wishes to remain anonymous, acting in self-defense. The individual let out a dog, which then immediately ran after what appeared to be a bear cub. The dog was stopped at the end of the tree line barking when the owner saw a bear appear and attack the dog. The individual went to assist the dog and the bear ran off. As the owner attempted to render aid to the injured dog, the bear retuned to the scene and approached the resident who then shot the bear. The situation was reported to the DNR and investigated. It was determined to be a justifiable killing of the bear. The Wetherells were informed late yesterday of the findings. The Ansel boys haven’t been putting as many turkeys in the freezer as they had planned, but so far we have five of them down! Just recently my brother Darryl took a huge bird not far from home, and it might be one of the biggest he’s ever taken. It seems that their wasn’t a whole lot of activity that first week, but things have picked up substantially of late. Some times that “third” hunt turns out to be the best thing going when the weather isn’t cooperating. The “gobbling” has definitely picked up and I think more birds are starting to make mistakes! At least Darryl’s big boy did. He called it right into him with a little wooing from his hen yelp and cackle. His little Remington 870 with a turkey choke put the smack-down on the longbeard. Actually it was quite a longbeard as it measured right at the 12 inch mark, making it one of the longest beards any of us have ever seen. The spurs were just over an inch with a small curve just starting, which means this was not a super old bird. We got a few more with the third hunt permit, and are going to do our darndest to fill some more tags. Back to the turkey woods we go.